Dropping a few pounds and keeping it off takes discipline. While most people want to do it as quickly as possible, this is not the healthiest choice. Losing too much weight too quickly makes you more prone to gaining it back. Effective weight management is about making adjustments to your eating habits, increasing your level of activity and making changes to your lifestyle. “It’s natural for anyone trying to lose weight to want to lose it very quickly. But evidence shows that people who lose weight gradually and steadily (about 1 to 2 pounds per week) are more successful at keeping weight off,” says the Centres for Disease Control and Prevention. “To lose weight, you must use up more calories than you take in. Since one pound equals 3,500 calories, you need to reduce your caloric intake by 500-1000 calories per day to lose about 1 to 2 pounds per week,” they add. Losing weight is a numbers game. At its core, it comes down to calories consumed and calories burned. To lose weight, you need to consume fewer calories than you burn. Remember that your 500 calorie deficit does not have to come from food alone. You can also increase your level of physical activity to achieve your objectives. A typical pasta meal is about 500 calories -300 calories from pasta, 200 calories from sauce. 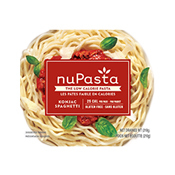 One full plate of NuPasta has 25 calories, whereas the same amount of regular pasta contains about 300 calories. 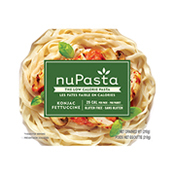 Do the simple math—by switching to NuPasta, you will be cutting about 275 calories per meal. Couple this with an exercise plan where you burn an extra 250 calories per day, and you will have achieved your required 500 calorie deficit to stay on track with your one pound per week weight loss goal. 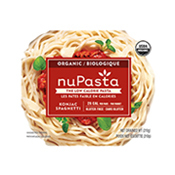 If you typically eat pasta 3 times per week, simply substituting NuPasta would reduce your weekly calorie consumption by 800-900 calories per week. 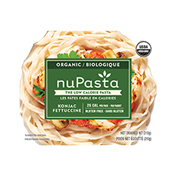 You can also use NuPasta to replace other high calorie meals to lower your overall calorie intake. Making these subtle changes throughout the week will help you more easily reach your weight loss goals, without having to significantly alter your diet or give up pasta. This is a win-win situation for everyone. You can still enjoy your favorite pasta dish, while losing weight at the same time. 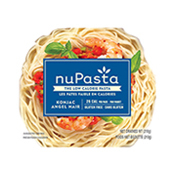 Make NuPasta part of your weight management plan. Shop now! Or find a store near you.